Machu Picchu is a rarefied place. I visited Machu Picchu in May 2015 (read my complete guide to Machu Picchu here) and did not regret it a single second. The lost city of the Incas receives only a maximum of 2,500 visitors a day, yet the UNESCO put it on its list of endangered World Heritage Sites. Perched high on a precarious mountain ridge, it is little wonder that no hotels are allowed anywhere near the ruins. With one exception: The Belmond Sanctuary Lodge Machu Picchu, your one and only chance to get closer to Machu Picchu than anyone else. Note: I get commissions for purchases made through links in this post. I had no association with Belmond whatsoever when writing this review. My opinions are my own, as was the money that paid for my stays. Know that all other visitors have to stay in Aguas Calientes, a town some 400 meters below Machu Picchu (here’s a guide to the best hotels in Aguas Calientes). Thus, each morning before dawn, a host of buses sluggishly make their way up to the entrance following the serpentine road, while some tourists opt for walking the countless exhausting steps. Guests at the Belmond Sanctuary Lodge, on the other hand, literally only have to fall out of their beds to be the first at the entrance. It is a luxury few can afford. But those who do invest that extra dime will get to know the ancient Inca citadel in a way all the other tourists cannot imagine. 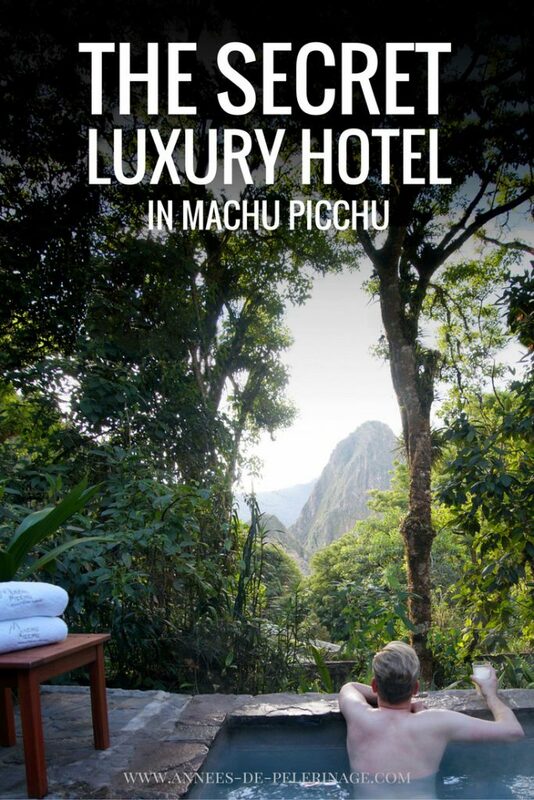 Here is my review of the arguably best hotel in Machu Picchu. Want to know what else I did in Peru besides Machu Picchu? Check out my luxury itinerary for Peru! This proximity itself is a luxury. Why? 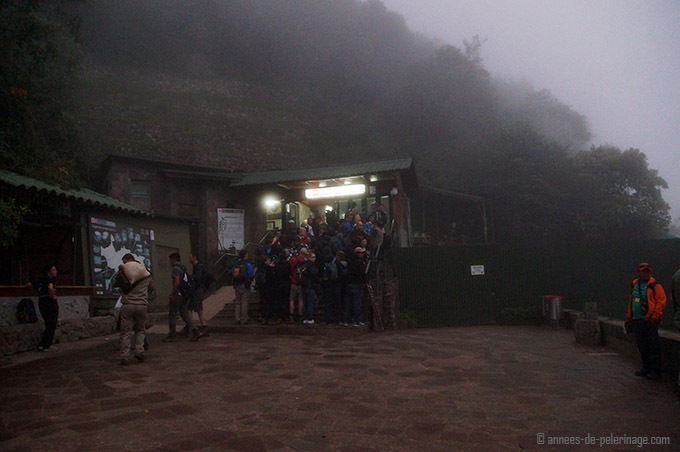 Because the doors to Machu Picchu open at 6 am. Walking, you need roughly 90 minutes to reach the top (if you are fast), while getting on the first bus is usually impossible since you are far from being the only one trying to get on. So, if you want to be the first at the entrance for the sunset and don’t want to get up at 3 am, well then your only choice is the Belmond Sanctuary Lodge. Note: Personally speaking I’d say that being at the entrance at 6 am is not needed. Usually, it is the evening hours that are most precious since the morning hours tend to be foggy. 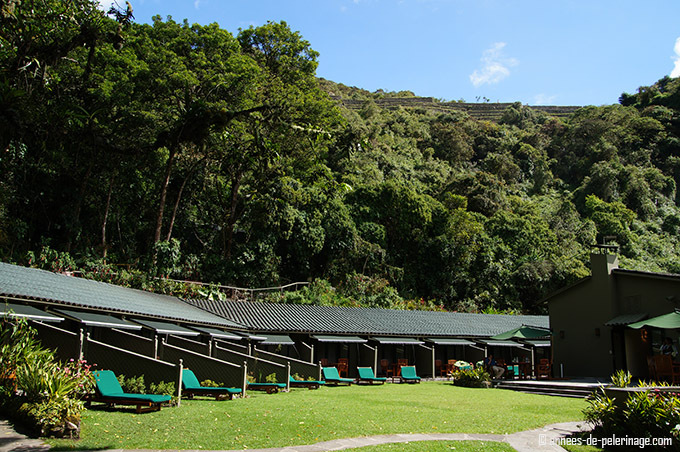 But even there the Sanctuary Lodge has its advantages since you don’t have to worry about catching the last bus to Aguas Calientes and onwards to Cusco. You’ll know that only a short walk away a spa will wait to wash away the sores of the day. Why do I mention the spa first? Obviously, because it is such a unique place! 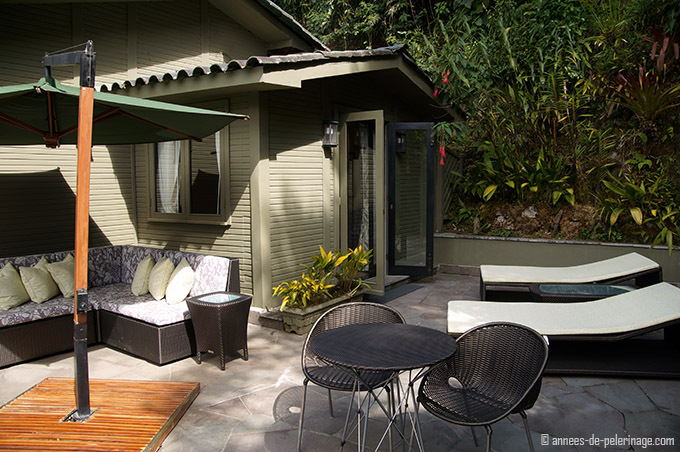 The Belmond Sanctuary Lodge has a little hot tub hidden in between the dense foliage surrounding the hotel. 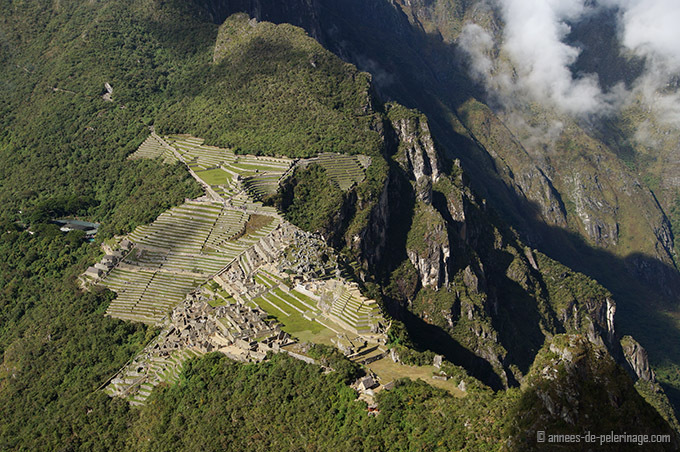 And from there you have the most stunning view on parts of Machu Picchu and especially Wayna Picchu. 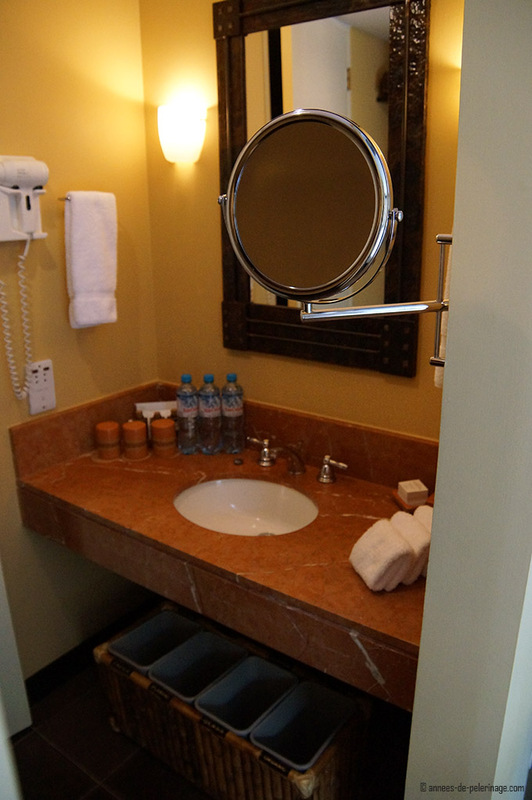 The staff will kindly serve any alcoholic beverage you’d like while you soak away the strains of the day. 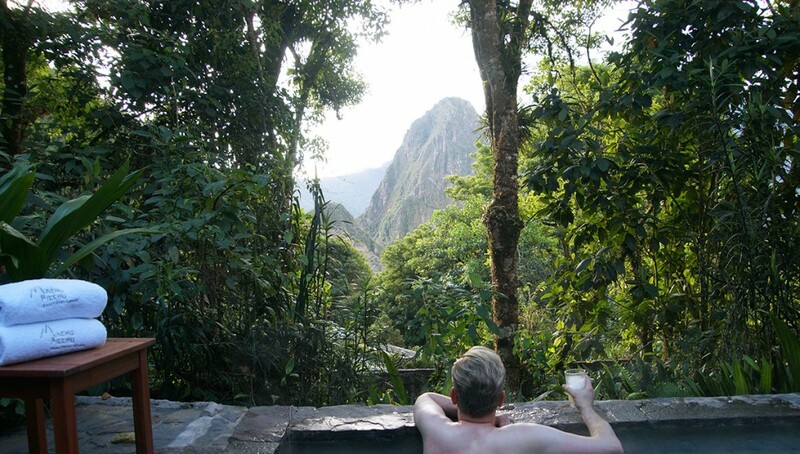 Can there be a better way to enjoy the ancient Inca ruins than sitting in a Jacuzzi drinking a Pisco Sour? 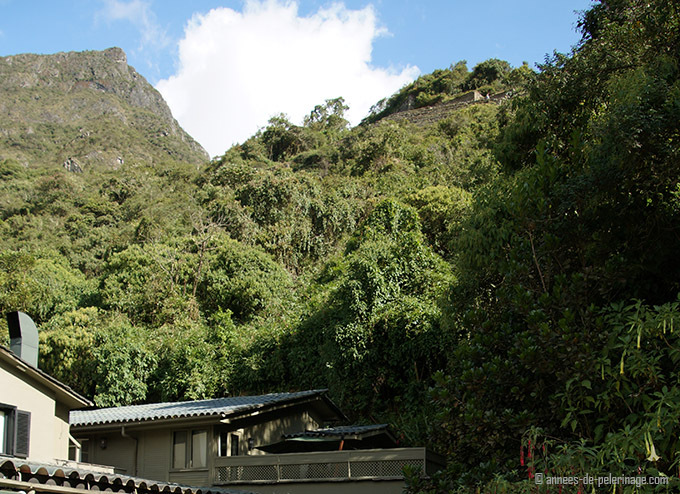 You can even see Huayna Picchu from the lodge. And talking about the mountain view: Belmond Sanctuary Lodge also has a one of a kind outdoor treatment room. I’ve been at a lot of formidable spas in my life (check out my review of the Aman Hotel at Summer Palace in Beijing so you know what I am talking about), but this massage platform beats it all. 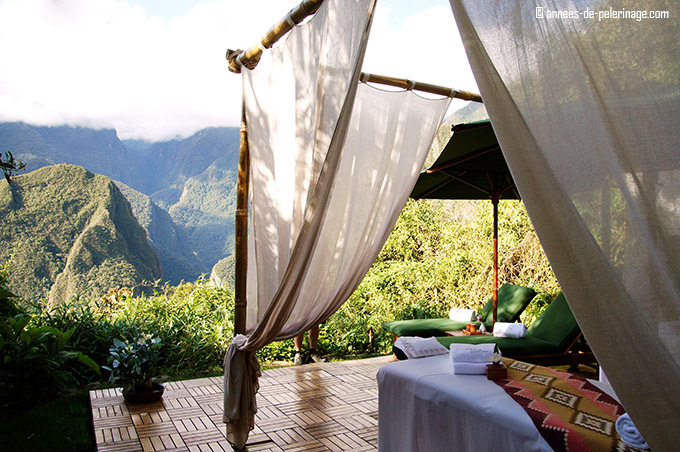 If true luxury has a name then it is getting a massage while looking upon Machu Picchu. The Belmond Sanctuary Lodge has 31 rooms all in all. Free Wifi and minibar, but none of them are very big. Some even just 15m² meters big. Here is a picture of the standard terrace suites. As you can see they got their own little terrace but it is only separated by a wooden fence and only moderately private. Still, the view on Machu Picchu and the surrounding sanctuary is just as spectacular. On my stay, I optioned for the presidential suite because it was the only room with its own private terrace. The terrace featured a wonderful sitting area, sunbeds and its own orchid garden around it (which sadly had little blooms due to the dry season) – nothing all too spectacular in terms of design, but solid luxury. The bedroom itself was rather rustic. None of the materials cheap, you could tell. But there was a focus on a strange kind of authentic Peruvian aesthetics that made it feel outdated to the interior design fanatic I am. I’ve heard complaints from other travelers, who took the standard rooms, that they felt very cramped with a 3-star charm. To those I have to say: I’m sure Belmond (formerly known as Orient Express) is considering a refurbishment, but other than that you are staying right inside a unique place and that alone is pure luxury. Bigger rooms are probably simply not possible due to strict regulations from the government. There is only so much space available for hoteliers in front of the gates of a World Wonder. Other than that I mostly stuck to the wonderful terrace of my room. Here is another view from outside, to give you an impression of dimensions and surroundings. Depending on the duration of your stay, I’d urge you to take a suite. I checked out the other rooms during my stay and my review might have turned out less favorable if I stayed in a standard room. If you want luxury, you have to pay for luxury, I guess. But, like I already said, I was very satisfied. 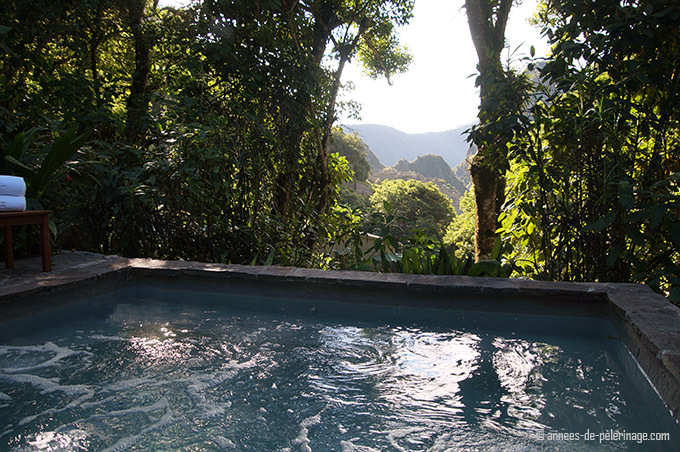 The suite really gave me the perfect space to relax after hiking Wayna Picchu. What all rooms have in common is the same tiny bathroom. There is just this little sink (with a little wardrobe on the other side). Even if you’d try, two people wouldn’t fit in there. Same applies to the shower (no bathtub, sorry ladies). It really was nothing special but did its job. Altogether the bathroom facilities have about 4 square meters. 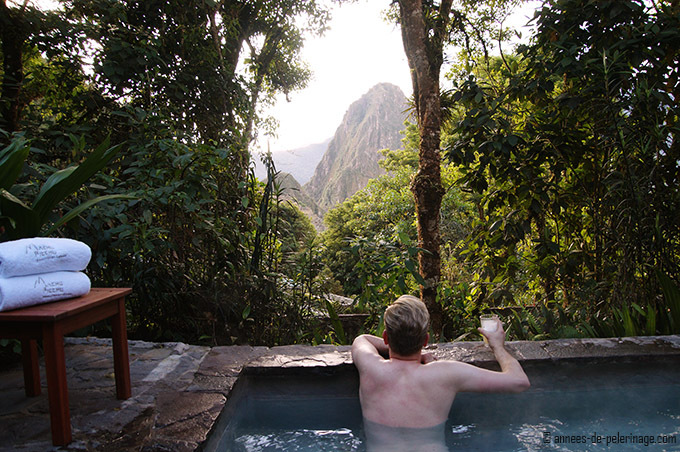 But don’t cringe: rather enjoy the hot tub with the Machu Picchu view as often as you can! Building space really is an expensive commodity so close to the entrance, still, I have to figure in the tiny bathrooms as a negative in my review of the Belmond Sanctuary Lodge. So let’s review the food. You will be on your feet at a rather high altitude (Machu Picchu is located 2.400 meters above sea level) all day. A healthy diet will be essential and the Belmond Sanctuary Lodge really goes beyond meeting that expectation. All food and drinks will be included in your room price; there is only one restaurant, however, where breakfast, lunch, and dinner are served. Okay, I lied: There is also a crowded buffet-style restaurant inside the hotel where a lot of day-tourists book lunch in advance. In my opinion there really is no point in going there (FYI: both Restaurants are open to the public). The quality at the buffet will be inferior (though arguably still good! 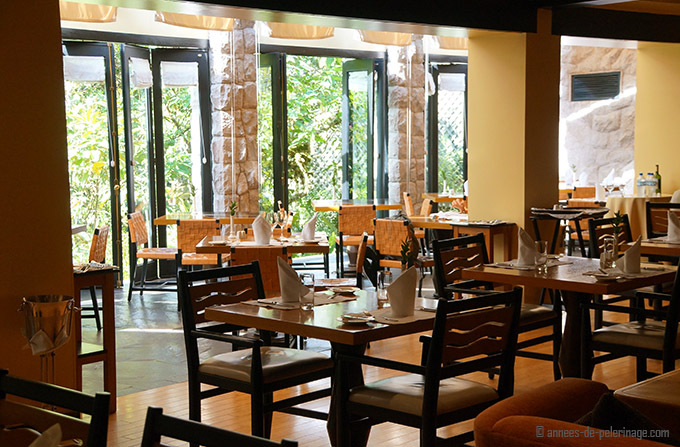 ), plus you will be served a very selected 4 to 6-course meal in the other restaurant at no additional cost. What you can see above is a (crappy mobile) picture of one of the starters. The food, in general, is excellent, with a healthy dose of Peruvian influence. 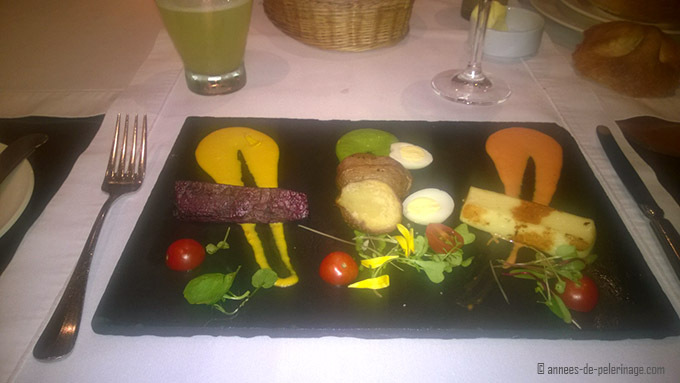 It is nothing in the way of Michelin star cuisine, but for Peruvian standards, it is very good indeed. Remember? Initially, I said that staying at the Belmond Sanctuary Lodge luxury hotel would give you the unique opportunity to experience Machu Picchu in a way few other tourists will? Well, I already mentioned the hot tub, the outdoor treatment room and of course the location. But there is more to it. Machu Picchu is basically located inside a mountain rain forest. A fact most people forget (but are soon to realize upon arrival when the first mosquito bites them). 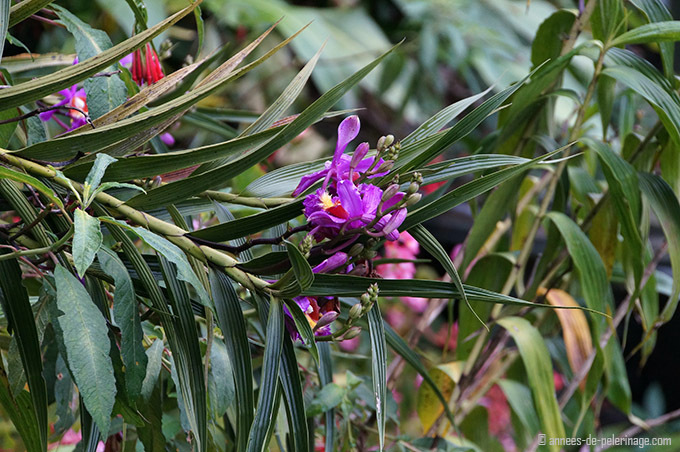 That being said, there are a huge amount of orchids to be found in the vicinity of the Inca ruins. Since you have to stick to the official paths there is little chance to see them. 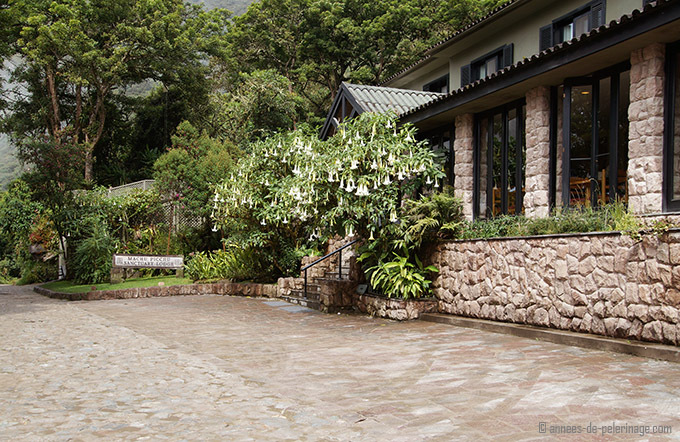 The Belmond Sanctuary Lodge, on the other hand, has a thriving orchid garden inside its little park. Just ask at the reception and a guide will give you a private tour. If you are lucky, you will see hummingbirds and monkeys as well! 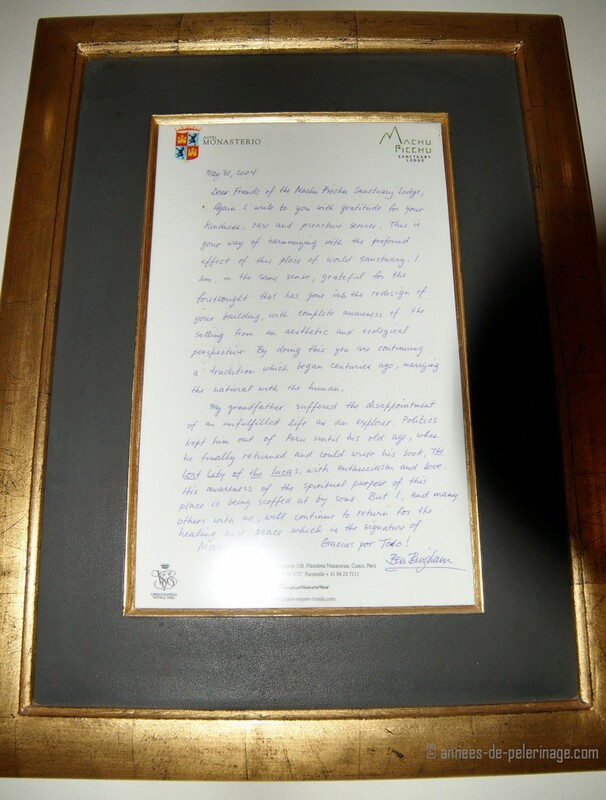 And talking about guides: Inside the small lobby of the luxury hotel, you will find an official recommendation letter from Ben Bingham, grandson of the famous Hiram Bingham who rediscovered Machu Picchu. It is a testimony to the service of the hotel. But also hints to the fact that the Belmond Sanctuary Lodge will offer you the best guides to show you all the grannies and niches of the ruins. There is only one motorized way into Machu Picchu: The train from Ollantaytambo to Aguas Calientes (train starts near Cusco). Here is where most people will take residence if they don’t take the famous Inca trail, that is. 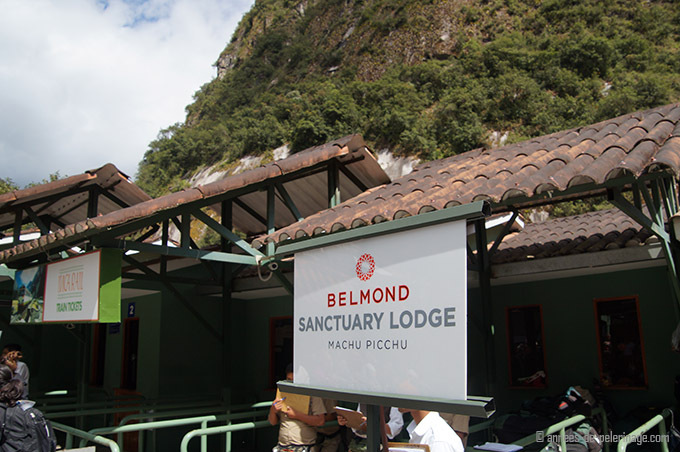 Even as a guest of the Belmond Sanctuary Lodge there is no other option than taking the train to Aguas Calientes. The hotel has a very little private section at the train station, however, where hotel employees will be waiting to take care of your luggage. Belmond also offers its own luxury train to Aguas Calientes and thus a less crowded approach: The Hiram Bigham. 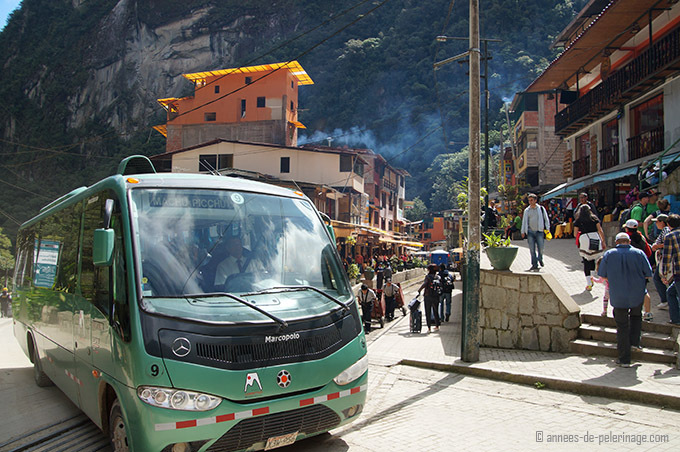 From the train station up to Machu Picchu, where the hotel is located, you will have to take the regular tourist bus. There is no other bus (your big luggage will be transported separately by the staff). The bus ride will take about 30-40 minutes. Be warned in advance that the ride will be very steep. The mountains around Machu Picchu are almost vertical. Why they didn’t install a cable car there is beyond me – it certainly would solve a lot of problems and get rid of the ugly and dangerous road. As for departure from the Belmond Sanctuary Lodge, the same procedures applies – only vice versa. Check-out time is quite early (11:00 am). The hotel is aware, though, that a lot of tourists will spend the remainder of the day inside the ruins of Machu Picchu. 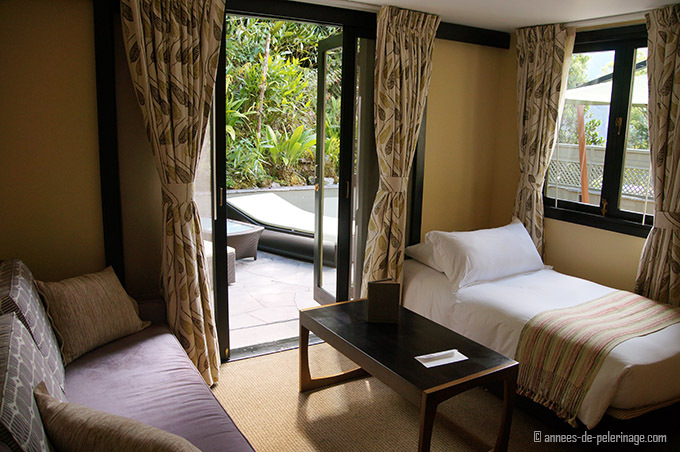 So there is a spacious day room nestled inside the orchid garden that is open for use by any guests after check-out. 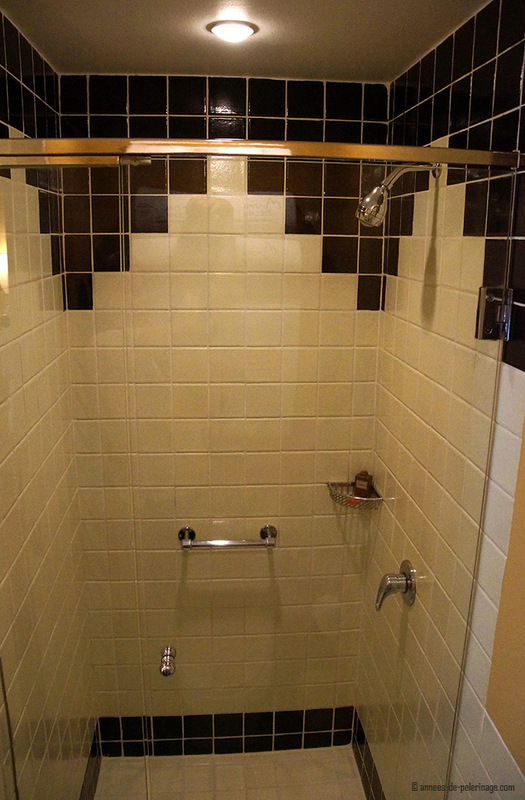 There are a shower and changing room, as well as a spacious living room with a TV at your disposal. Let’s sum up my review of Belmond Sanctuary Lodge: Your main reason to stay at this luxury hotel will be quite obviously its unique location. There is no denying that the rooms are quite tiny and the design a bit outdated. There is also no denying that the price is quite staggering as well. In the dry seasons, rooms start from 1.000 USD a night. The food, however, is way above the Peruvian standard and so is the service and friendliness of the staff. As for the spa: If you are looking for a unique facial treatment then the Belmond Sanctuary Lodge might be the wrong spa to choose. What they do offer you is a unique location. In terms of massages and other relaxing treatments that is worth a lot and will thoroughly enhance your experience in way few other spas around the world are able to. Accessibility of the hotel is, due to its purpose, not the best. You will share the same hardships as any other visitor, so I guess this is really no reasons you can hold against Belmond. All in all, it really is the best hotel in Machu Picchu. I love booking.com, simply because you can usually cancel up to 48hours before your stay – so no risk involved. Other than hat I hope you liked my review of the Belmond Sanctuary Lodge in Machu Picchu. If you got anything to add or questions, feel so free and use the comments below. 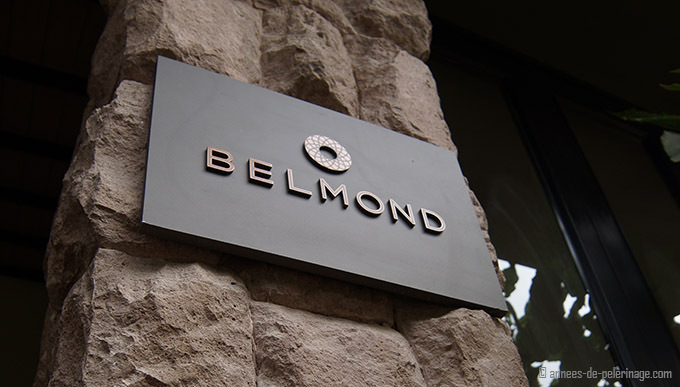 Disclaimer: I had no association with Belmond hotels whatsoever when writing this review. My opinions are my own, and so was the money that paid for the stay. All in all, I stayed 3 nights at this luxury hotel in their biggest suite. We stayed at the Sanctuary Lodge in April 2016 and the outdoor hot tub has been permanently closed. REALLY?! damn this is new to me (my last visit dates back to 2015). Damn..I’ll contact them and will adjust this article accordingly. Is it really over $1000 USD per night?? there is a direct link to booking.com where you can check out current prices. 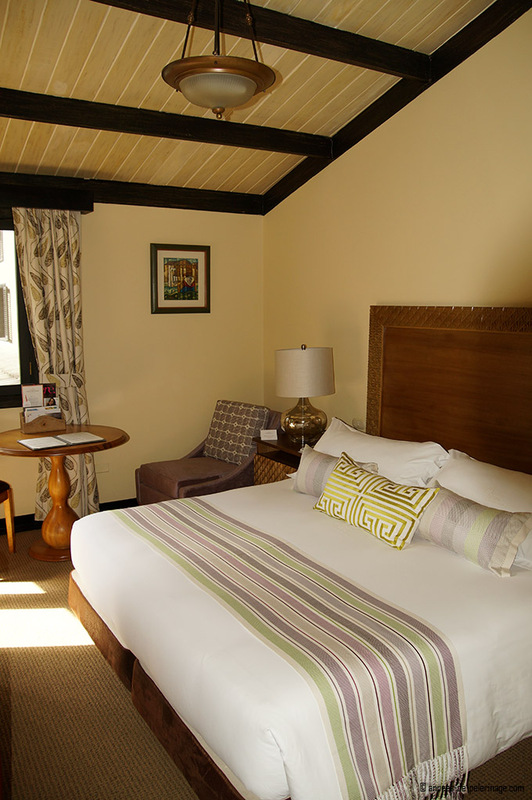 In high season the price per night is actually closer to 2,000 USD per night. The big suite I slept in roughly twice that amount. Hope that helps. Thanks a lot for your review is accurate, precise and honest. I love what you say about the location, the pool. At the end we will be more outside walking and in the afternoon taking a nice bath in the pool or why not a massage. That would make the trip + the train ride from cusco and the way back. Thanks for teaching.